Coös County (/ˈkoʊ.ɒs/, with two syllables), frequently spelled Coos County, is a county in the state of New Hampshire, in the United States. As of the 2010 census, the population was 33,055, the least of any New Hampshire county. The county seat is Lancaster. The two-syllable pronunciation is sometimes indicated with a dieresis, notably in the Lancaster-based weekly newspaper The Coös County Democrat and on some county-owned vehicles. The county government uses both spellings interchangeably. 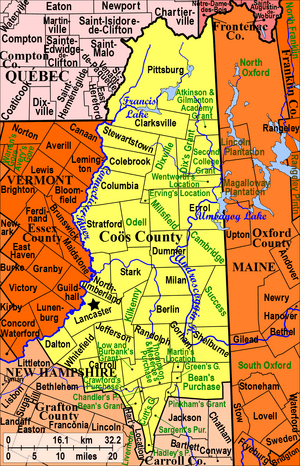 Coös County is part of the Berlin, NH–VT Micropolitan Statistical Area. It is the only New Hampshire county on the Canada–United States border, south of the province of Quebec, and thus is home to New Hampshire's only international port of entry, the Pittsburg-Chartierville Border Crossing. Coös County includes the whole of the state's northern panhandle. Major industries include forestry and tourism, with the once-dominant paper-making industry in sharp decline. The county straddles two of the state's tourism regions. The southernmost portion of the county is part of the White Mountains Region and is home to Mount Washington. The remainder of the county is known as the Great North Woods Region. Coös County was separated from the northern part of Grafton County, New Hampshire and organized at Berlin December 24, 1803, although the county seat was later moved to Lancaster, with an additional shire town at Colebrook. The name Coös derives from the Algonquian word meaning "small pines". During the American Revolutionary War two units of troops of the Continental Army — Bedel's Regiment and Whitcomb's Rangers — were raised from the settlers of Coös. From the Treaty of Paris of 1783 until 1835 the boundaries in the northern tip of the county (and New Hampshire itself) were disputed with Lower Canada (which was soon to become part of the Province of Canada), and for some years residents of the area formed the independent Republic of Indian Stream. According to the U.S. Census Bureau, the county has a total area of 1,830 square miles (4,700 km2), of which 1,795 square miles (4,650 km2) is land and 35 square miles (91 km2) (1.9%) is water. It is the largest county in New Hampshire by area, and it is one of only two counties in the United States to share land borders with two different states and another country, along with Boundary County, Idaho. Much of its mountainous area is reserved as national forest, wilderness, state parks and other public areas; these encompass most of the northern portion of the White Mountains, including all the named summits of the Presidential Range (though one, Mt. Webster's, lies about 200 feet (61 m) from the county line). Mt. Washington's peak is the highest in the Northeast. The 162-mile Cohos Trail runs the length of the county. The principal state highways in Coös County are New Hampshire Route 16, which runs mostly parallel to the Maine state line, and New Hampshire Route 26, which traverses the Great Northern Woods from Vermont Route 102 southeast to Maine Route 26 towards Portland. The two major US Highways are US Route 2, which roughly bisects the county from Lancaster to the Oxford County line, and US Route 3, which runs from Carroll in the south to the Canada–US border at Pittsburg/Chartierville, where it continues as Quebec Route 257. In the county, the population was spread out with 22.80% under the age of 18, 6.30% from 18 to 24, 26.70% from 25 to 44, 25.70% from 45 to 64, and 18.50% who were 65 years of age or older. The median age was 42 years. For every 100 females there were 95.60 males. For every 100 females age 18 and over, there were 92.60 males. As of the 2010 United States Census, there were 33,055 people, 14,171 households, and 8,879 families residing in the county. The population density was 18.4 inhabitants per square mile (7.1/km2). There were 21,321 housing units at an average density of 11.9 per square mile (4.6/km2). The racial makeup of the county was 96.9% white, 0.5% Asian, 0.4% American Indian, 0.4% black or African American, 0.3% from other races, and 1.4% from two or more races. Those of Hispanic or Latino origin made up 1.2% of the population. In terms of ancestry, 18.2% were English, 16.9% were Irish, 16.4% were French Canadian, 6.6% were American, 6.5% were German, and 5.6% were Italian. Of the 14,171 households, 25.3% had children under the age of 18 living with them, 48.5% were married couples living together, 9.2% had a female householder with no husband present, 37.3% were non-families, and 30.3% of all households were made up of individuals. The average household size was 2.23 and the average family size was 2.72. The median age was 46.4 years. The median income for a household in the county was $41,534 and the median income for a family was $52,825. Males had a median income of $41,816 versus $29,086 for females. The per capita income for the county was $22,976. About 8.7% of families and 12.1% of the population were below the poverty line, including 17.1% of those under age 18 and 9.1% of those age 65 or over. Modern town borders in Coös County, New Hampshire. Cities and towns are named in black and have town records. Green places are unincorporated, and do not keep records. Robert Frost, who once lived in Franconia in neighboring Grafton County, wrote the poem "The Witch of Coös". Coös County is the setting for the John Irving novel Last Night in Twisted River, Twisted River being a logging settlement in the county. Coös County, New Hampshire Facts for Kids. Kiddle Encyclopedia.